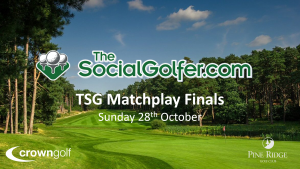 The TSG MatchPlay Championship ran similarly to an FA Cup style knockout with participants arranging each round of matches at a course of their choice. With clubs in the Crown Golf offering preferential green fees at its venues including Hampton Court GC, Chesfield Downs GC, throughout the summer for TSG members. The finalists Dave Short (Essex) and Ollie McCormack (London) both worked their way through a field of 64 to secure their place at Pine Ridge, having played six matches across the year. In addition, the two losing Semi-finalists Brigitte Lockwood (London) and Andy King (Kent) competed in the third-place play-off. The final began with Short (11 Handicap) going 3up after three holes, meaning veteran TSG match-player McCormack (10 Handicap) had a mountain to climb to get the game back. After a valiant effort, McCormack pegged two holes back only to lose them again by the turn. The pair then played the first hole again, twice, before Short holed out for a Par to clinch victory! Meanwhile, the third-place trophy went to Kent TSGer Andy King, who’s game was settled on the 17th. TPC Sawgrass GC is in the southeastern United States located in Ponte Vedra Beach, Florida. It is the HQ for the PGA America and annually hosts The Players Championships. Each year BIGGA members can apply for the opportunity of a lifetime, joining the golf course maintenance team at TPC Sawgrass. Greenkeepers from around the world get the chance to be part of ‘The Players’ backroom team and BIGGA (The British and International Golf Greenkeepers’ Association) has revealed the first two members who have been selected to take part in the John Deere TPC Sawgrass Volunteer Programme for 2019. In total, six BIGGA members will be selected to take part in the event, with one selected from each of BIGGA’s five regions and a sixth being selected from the ranks of international members. Following the final day’s play, before heading home, the greenkeepers will get the opportunity to hit the 17th hole’s famous island green. But why is this Crown Golf News? One BIGGA member selected from over 5,000 applicants, is Andy Copeland (above left) from Chesfield Downs in Hertfordshire. Andy recently had an up-close look at course preparations for another massive tournament, being invited along with other greenkeepers to visit Le Golf National ahead of the Ryder Cup. Andy will be out there volunteering for the full duration of the tournament helping to set up the golf course for play. Since his arrival in June 2016 to Chesfield Downs GC, the course has seen vast improvements under his leadership of the course conditions. And the Greens that have been quoted as ‘Best in the Area’ with nothing but positive comments coming from all that play the course. Andy has created a team around him that share his passion and are striving for the same goals as Andy sets himself. 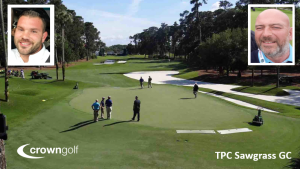 In 2019 The Players Championship will return to its former March date, necessitated by the shift of the PGA Championship from August to May. 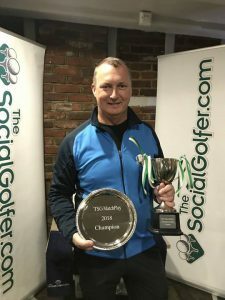 However, with another link to The Social Golfer, head greenkeeper at Cleethorpes Golf Club (and Event Director at this year’s TSG Charity British Inclusive Golf) Matthew Shaul (above right) has also been selected to take part.